Our objective is to develop an ongoing relationship with our clients that focuses on discovering and defining the client’s financial goals. We then develop a plan to assist each client achieve those goals. 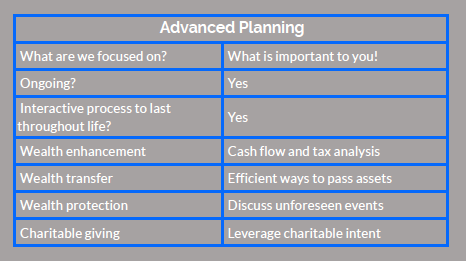 We take a holistic approach to planning, considering areas such as: education, insurance, taxes and estate planning. We manage wealth using portfolios that are tailored to our clients’ current individual situation and long-term aspirations. We help our clients identify, evaluate and achieve their financial goals by offering an integrated financial planning and investment management service that is implemented with the highest degree of integrity, excellence, and professionalism. You can view a more detailed approach of our investment experience here.